The AANA has expressed its strong opposition to the recent decision by health insurer Anthem, Inc., which directs ophthalmologists to assume responsibility for anesthesia administration and patient monitoring during routine cataract surgeries, calling the move a “dangerous and reckless policy that jeopardizes the safety and well-being of millions of patients, all in an effort to cut costs and increase profits.” The AANA represents more than 52,000 CRNAs, anesthesia experts who frequently provide patient care during eye procedures. “While cataract surgeries are generally routine,” said Bruce Weiner, DNP, MSNA, CRNA, president of the AANA, “any surgical procedures that require anesthesia, especially those involving hypersensitive areas like the eyes, call for highly educated anesthesia professionals like CRNAs to administer medication and monitor patients properly without distraction.” Read more. April is Celebrate Diversity Month, and the American Association of Nurse Anesthetists (AANA) is observing this month with the “I AM ME” campaign. We are asking Certified Registered Nurse Anesthetists (CRNAs) and Student Registered Nurse Anesthetists (SRNAs) to send a photo and 1-3 sentences about what makes you, you! Our goal is to post your personalized “I AM ME” statement on Twitter and Facebook the entire month of April. Annual Congress is right around the corner. Remind your program administrator that nominations for the Student Excellence Award are due soon. Learn more on the Opportunities for Students webpage on the AANA website. If you're interested in participating in the College Bowl at the AANA Annual Congress this year, ask your program administrator to submit your application and include seven questions on your behalf. Learn more on the Opportunities for Students webpage on the AANA website. Interested in getting involved in AANA committee work? The Student Representative to the AANA Education Committee enhances communication between the student body and the objectives and philosophies of the AANA. Learn more on the Opportunities for Students webpage on the AANA website. On March 13, 2018, the AANA submitted comments to the U.S. Food and Drug Administration (FDA) Opioid Policy Steering Committee regarding opioid prescribing interventions. The letter emphasized CRNAs' use of multimodal anesthesia techniques and enhanced recovery after surgery (ERAS) protocols to help minimize or eliminate the use of opioids during the perioperative period through the patient’s recovery at home. Read the letter on the AANA website. The Joint Commission reviewed 805 sentinel events in 2017. Most of these events were self-reported by an accredited or certified entity. The top ten include unintended retention of a foreign body, fall, wrong-patient, wrong-site, wrong-procedure, suicide, treatment delay, other unanticipated event, criminal event, medication error, operative/postoperative complication, and self-inflicted injury. There were 4 anesthesia-related sentinel events reported to The Joint Commission. These events must be reviewed by the organization and may also be reviewed by The Joint Commission. Because an estimated fewer than 2 percent of all sentinel events are reported to The Joint Commission, no conclusions can be drawn about the actual frequency of events over time. Earn 22.75 Class A Credits with critical topics, including normal and abnormal physiology of pregnancy, pharmacology, analgesia/anesthesia techniques, and more. Now offered at a state-of-the-art facility in central Cincinnati, you'll refresh your knowledge with didactic lectures and hands-on instruction led by expert CRNA faculty. Register by April 3rd to save! Are you prepared to advocate effectively on Capitol Hill for protecting and advancing nurse anesthesia practice? At the AANA Mid-Year Assembly, you'll gain professional advocacy skills and healthcare policy understanding that promotes leadership at the national level and in professional practice. Join us for the 85th annual AANA national meeting at the Boston Hynes Convention Center. AANA 2018 promises to bring technology to the forefront of anesthesia education. Watch the video for a preview of what you can expect. Registration opens in early April. 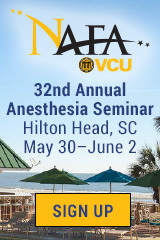 Mark your calendar and watch the Anesthesia E-ssential for details! Each year the AANA Foundation presents awards at the AANA Annual Congress to individuals who have made a difference in the nurse anesthetist community. The extended deadline for Award nominations is April 30, 2018. Presented to an advocate committed to supporting the AANA Foundation and encouraging others to do the same. Presented to an individual who has made a significant contribution to the practice of anesthesia through clinical research. Presented to an individual who has donated time, talent and direct financial support to the AANA Foundation and other deserving organizations. Presented to a CRNA who wishes to volunteer and provide anesthesia, education and training in needy areas. Forward the completed form to the AANA Foundation – email to foundation@aana.com or mail to 222 S. Prospect Avenue, Park Ridge, IL 60068. “State of the Science” offers an opportunity for CRNAs and SRNAs to present their research findings and innovative educational approaches at the AANA Nurse Anesthesia Annual Congress in Boston, Mass., September 21-25, 2018. Research, literature reviews, and innovative, creative techniques in anesthesia are appropriate topics. Applications are currently available on the AANA Foundation web page. When you take advantage of this matching gift, as a CRNA, your $500 donation becomes a $1,000 donation. As an SRNA, your $100 donation receives an additional $1,000 donation from NBCRNA. We ask that you take advantage of this generous match, and make a donation today by visiting the Foundation web page. For more information, contact the Foundation at (847) 655-1170 or foundation@aana.com. Korean researchers assessed the safety of combined bupivacaine and lidocaine for postoperative pain in pediatric patients undergoing urologic inguinal and scrotal surgery. The prospective study involved 55 children, divided into groups based on how old they were and whether they were having unilateral or bilateral surgery. Each patient received a mixture of bupivacaine and lidocaine at the surgical site just before the procedure was completed and was checked for hemodynamic and electrocardiographic parameters before the local anesthesia was administered, 30 minutes afterwards, and again after 60 minutes. All of those measurements were normal at all intervals, with no related adverse events documented. Based on the study results, the investigators from Pusan National University School of Medicine believe that bupivacaine plus lidocaine can be safely used to manage pain in children following urologic inguinal and scrotal surgery. From "The Safety of a Mixture of Bupivacaine and Lidocaine in Children After Urologic Inguinal and Scrotal Surgery"
The Cleveland Clinic investigated the effect of administering corticosteroids following anesthesia induction with etomidate in the setting of non-cardiac surgery. Researchers working on the project theorized that the intervention would lower a composite of in-hospital mortality and cardiovascular morbidity among these patients, and they prespecified that composite as the primary endpoint. The study included 4,275 Cleveland Clinic patients who met the inclusion criteria. Of about 800 patients who received steroids intraoperatively—typically dexamethasone—582 were matched with 1,023 patients who did not receive steroids. There was no meaningful difference in the main endpoint between the two sets of patients. However, a secondary outcome—postoperative length of stay in the hospital—was significantly shorter in the steroid group compared to the non-steroid group. From "Steroid Administration After Anesthetic Induction With Etomidate Does Not Reduce In-Hospital Mortality or CV Morbidity After Non-Cardiac Surgery"
British Journal of Anaesthesia (03/01/2018) Vol. 120, No. 3, P. 501 Komatsu, R.; You, J.; Kasuya, Y.; et al. A multisite investigation explored the use of antiemetics plus amisulpride, a dopamine D2/D3 antagonist, for the prevention of postoperative nausea and vomiting (PONV)—a complication that prolongs the need for care. A total of about 1,150 adult patients at risk for PONV were enrolled in the study, all of whom were give one standard nondopaminergic antiemetic—typically ondansetron or dexamethasone. Additionally, roughly half of the participants were randomly assigned to intravenous amisulpride, with the other half receiving a matching placebo. Episodes of vomiting/retching, nausea, and use of rescue medication were documented up to one day after wound closure. Nearly 58 percent of patients in the amisulpride group achieved complete response, defined as no emesis or rescue medication within 24 hours postoperatively. By comparison, the primary endpoint occurred in 46.6 percent of the control patients. Emesis, nausea on any level, severe nausea, and demand for rescue medication all were markedly lower in trial participants who receive amisulpride; but adverse events were comparable between the two groups. The researchers conclude that intravenous amisulpride, when administered along with an antiemetic from another class, is safe and effective in the prevention of PONV in at-risk adults having elective surgery under inhalational anesthesia. From "Amisulpride Prevents Postoperative Nausea and Vomiting in Patients at High Risk"
Anesthesiology (03/18) Kranke, Peter; Bergese, Sergio D.; Minkowitz, Harold S.; et al. Spanish researchers have put together a case for anesthetizing both mother and fetus during open fetal surgery. The general argument is that pain relief administered to the former will reach the latter via the umbilical cord in interventions taking place before the third trimester. Findings reported by the University of Seville investigators, however, suggest that future babies already react to stress and/or painful stimuli in the second trimester. "The response of fetal stress to harmful stimulation that our monitoring teams observed in this case, does not completely prove that the fetus can feel pain," acknowledges study co-author Emilio Gómez González. "However, it is very improbable that there can be a perception of pain without a response to stress, and so these signals are often used as a substitute pain indicator." From "Researchers Advise the Use of Anesthesia in Fetuses From 21 Weeks of Gestation"
In the setting of major surgery, researchers say that patients with an opioid dependency are more likely than nonabusers to be readmitted to the hospital within 30 days. Using data from the National Readmissions Database for 2013 and 2014, a team from the University of Chicago identified adults who underwent a major operating room procedure—including nearly 95,000 whose medical records included a code for opioid abuse or addiction. After adjusting for covariates, they calculated the rate of readmission at 6.9 percent for opioid abusers and 5.3 percent for controls. At Massachusetts General Hospital, meanwhile, a review of the Healthcare Cost and Utilization Project's California Inpatient Database for 2010 and 2011 yielded similar findings. Patients with an opioid problem were readmitted at a rate of 15 percent versus 9.5 percent for patients with no dependence on the drugs. Additionally, opioid abusers in the University of Chicago retrospective analysis remain hospitalized for a lengthier period than nonopioid abusers, which in turn translated to higher costs. "This provides an opportunity for [anesthesia providers] to deliver enhanced recovery after surgery protocols, which may significantly improve this important statistic," said Louisiana State University professor Alan Kaye, MD, PhD. From "Readmission Rates and Costs Higher for Opioid-Dependent Patients"
New evidence shows that counseling ahead of hand surgery significantly lowers postoperative opioid use. Moreover, patients using nonopioid pain medications benefit from similar levels of relief and no worse adverse events. In one study, researchers at the Rothman Institute at Thomas Jefferson University in Philadelphia worked with a patient population that had carpal tunnel release (CTR) surgery using the same technique and who were prescribed an equal number of opioids afterwards. Some participants, however, received formal counseling; while others received none. Those who did receive counseling consumed two-thirds fewer opioid pain pills over the course of the study compared with those who did not. "Once patients were made aware of the risks, benefits and the safest ways to take opioids, they sought and pursued alternatives," remarked lead author Asif Ilyas, MD. "In addition, the actual pain experience was no different between the study groups." A second investigation by the same researchers compared the efficacy of oxycodone, ibuprofen, and acetaminophen for pain relief following CTR or trigger finger release (TFR) surgery. The results of the double-blinded, randomized trial showed that pain scores and adverse effects were similar across the three groups, as was medication use. Oxycodone patients took 2.9 pills on average during the first five postoperative days, versus 4.4 ibuprofen pills and 3.1 acetaminophine pills on average. Both studies were presented at the 2018 Annual Meeting of the American Academy of Orthopaedic Surgeons. "Our goal is to challenge the mindset of the absolute need for opioids following surgery," says Ilyas. From "Pre-Surgery Counseling, Non-Opioid Pain Relievers Shown to Reduce Post-Surgery Opioid Use"